How Big Can Koi Carps Grow? 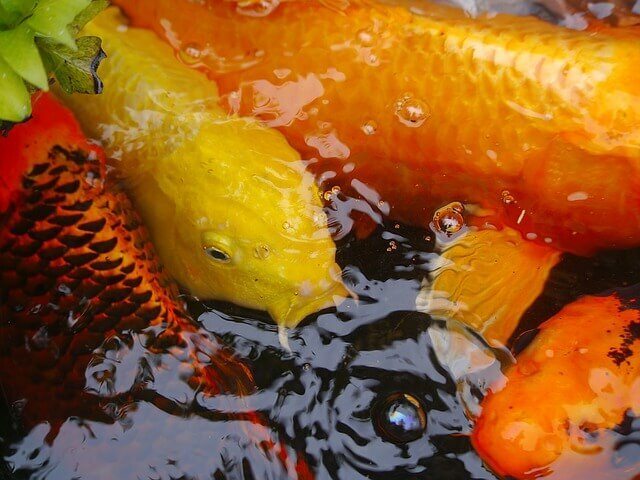 Home > Blog > Aquatic Animals > How Big Can Koi Carps Grow? Koi carp is one of the larger species of fish that are kept in ponds, and owners want them to get as large as possible. To achieve this, there are a number of factors you’ll need to consider, including genetics, feeding and water temperature, to name just a few. Below are some others. Under the most optimal conditions, the typical koi will reach a length of from six to eight inches during its first year, and by the age of three it will be fully mature. By this time its length will range from twenty four inches to thirty six inches, but exceptional specimens have been known to reach lengths of over fifty inches. However, these sizes are only possible under the most pristine pond conditions. Koi are extremely sensitive to their environment which means that if conditions aren’t exceptional than the results won’t be either. This is something that top koi breeders have known for decades. Genetics is another factor that will influence the size of the fish. Regardless of how well the pond is maintained, if the fish do not have the necessary traits which are predetermined, then they will not grow to spectacular size. The average koi owner who maintains their pond well can expect the majority of their fish to be no more than twenty inches. It is understandable that koi owners want the healthiest, biggest fish possible. The finest specimens can rival and even surpass purebred dogs in terms of price, with some koi retailing for more than $30,000 apiece. As with dogs, competitions are held annually to show off prize koi with winners receiving a variety of prizes and exposure. The sale and breeding of koi is therefore big business and whether you’re interested in competing at international or regional or events or simply growing koi for your own pleasure it is important to keep the following in mind. First, diet is a key factor in how well these fish will grow. They are grazers which mean if you feed them excessively much of the food will go to waste. Koi should be fed a diet rich in protein, and it should be distributed in small portions no more than five times a day. Koi will also put hormones inside the water, and when the concentration becomes high, their growth will be inhibited. This is a natural mechanism which prevents their environment (the pond) from becoming overpopulated. Therefore, you want a smaller population of koi in your pond combined with premium water quality. Koi are large so 250 gallons is the recommended amount for each one, so if you keep four koi in your pond it should contain at least 1,000 gallons of water. Outdoor ponds are better than indoors for koi as they will be exposed to the natural night day cycle and will have the opportunity to consume insects. If you do manage to get your koi to over 50 inches you should celebrate your good fortune.